Continuous Renal Replacement Therapy Market size was valued at USD 825 million in 2017 and is expected to witness 7.1% CAGR from 2018 to 2024. Increasing prevalence of acute kidney injuries will surge demand for continuous renal replacement therapies (CRRT) in foreseeable future. Acute kidney injury causes chronic renal disorders leading to severe loss of kidney function. According to NIDDK, around 14% of population in the U.S. suffers from renal disorders. Moreover, increasing per capita income and subsequent increase in healthcare expenditures will ensure availability of well-equipped public hospitals and critical care units thereby increasing continuous renal replacement therapy market growth. Moreover, increasing availability of technologically advanced CRRT systems ensuring fast recovery will further augment CRRT market growth. 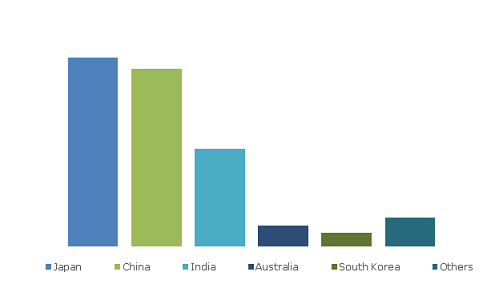 Rising prevalence of diabetes in developing economies such as India and China leading to chronic kidney diseases and partial loss of kidney function will escalate the business growth over forthcoming years. According to FIRSTPOST, in 2017 almost 72 million Indians were detected with diabetes that will eventually affect kidney functioning. Lifestyle changes and unhealthy eating habits should further worsen the situation impacting industry growth. 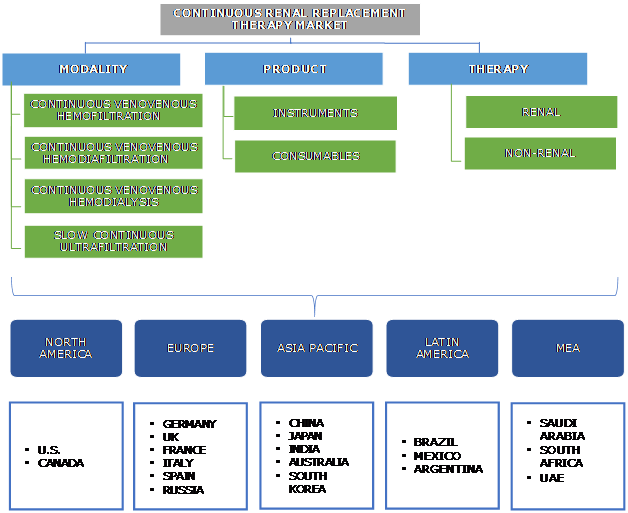 However, complications associated with the therapy may decrease its preference amongst geriatric population restraining continuous renal replacement therapy market growth during estimated forecast. Slow Continuous Ultrafiltration (SCUF) segment will witness 6.4% CAGR during the forecast timeframe. SCUF is mostly preferred by patients suffering from cardiac failure and blood pressure problems. There is a considerable reduction in the blood urea and creatinine levels after undergoing continuous slow ultrafiltration treatment. Increasing geriatric population in developed as well as developing economies that suffers from cardiac arrest due to kidney failure will boost segment growth over the upcoming years. 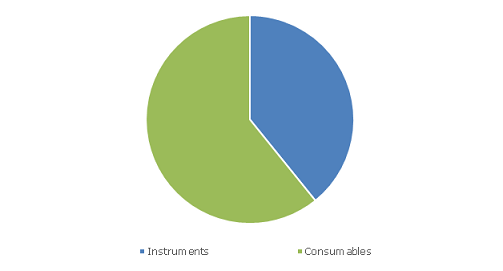 Consumables segment was valued at USD 500.7 million in 2017. CRRT involves use of consumables such as catheters and blood tube sets that are utilized in blood purification process. CRRT demands frequent replacement of consumables as reusing these consumables may lead to complications. High replacement rate coupled with increasing demand for CRRT therapies will augment the usage of consumables rendering positive impact on segment growth. Renal segment accounted for 79% revenue share and is expected to dominate the industry throughout forecast period. Renal therapies are utilized to treat patients experiencing kidney failure due to rapidly rising serum, urea and creatinine levels and severe metabolic acidosis. Availability of technologically advanced devices that are utilized in renal replacement therapies have ensured efficient removal of uremic toxins to maintain optimal salt levels. Aforementioned factors coupled with rising adult as well as neonatal population suffering from kidney failure will positively influence the business growth during forecast timeframe. Non-renal segment was valued at USD 172.9 million in 2017 and enormous segmental growth can be attributed to the growing preference for non-renal treatments recently. Non-renal therapies are imparted to people suffering from partial kidney functioning for ingested toxins clearance, electrolyte abnormalities correction, temperature control and also in the treatment of chronic sepsis. According to Sepsis Alliance, around 26 million people globally are affected by sepsis every year that will augment the demand for non-renal therapy propelling segment growth during forecast timeframe. Prominent industry players operational in the CRRT market include Asahi Kasei Corporation, B.Braun Melsungen, Baxter International, Fresenius Medical Care, Infomed, Medica, Medical Components, Medites, Medtronic, Nikkiso, Nxtstage, Toray. These manufacturers implement few strategies such as strategic mergers and acquisitions that render companies with competitive advantage. For instance, in October 2018, Baxter applied for U.S. regulatory filling for PrisMax Acute Care System. PrisMax CRRT system that is integrated with advanced technology and is designed to improve the accuracy and performance. Introduction of technologically advanced products by Baxter will enhance company’s revenue share. The evolution of CRRT market has been significant and can be traced back to 1997 with the introduction of continuous arterio-venous hemofiltration (CAVH) by Dr. Peter Kramer. Later in early 1990’s, automated machines for continuous renal replacement therapy were made available in clinics and intensive care units that enabled efficient and accurate treatment of patients suffering from accurate kidney injuries. Currently, nephrologists have high recommendation for CRRT, as the systems utilized in this therapy are technologically advanced and have high costs. Despite the high cost of CRRT systems, preference is high due to efficiency offered by them. Therefore, key leaders adopt certain strategic initiatives includes incorporation of innovative technology within CRRT systems that enables them in attaining sustainable profits. Moreover, CRRT market has numerous growth opportunities in future owing to favorable regulatory landscape that enables availability of superior quality CRRT devices for treatment.